Let's face it - we're all a little nosey, right? And my life is far from boring, at least to me! So, here you go. I get up around 6:15am to get Buzz up. Who knew high school started so early?! I also make lunches for everyone for the day, and for some reason I forget to pack up my own lunch half the time. I catch up on my email, Facebook, and blog stuff till about 7:30/8:00, which is when I get Tink and Lightning up and I jump in the shower while they eat breakfast. I always think I'm going to take a shower before I wake them, but it never seems to work out that way. They catch the bus around 9:00 and then it's off to work for me. About 5 1/2 hours of complete bliss! Ok, maybe not, but this girl's gotta work, and I love my co-workers. They make it bearable! I come home when it's time to get the kids off the bus, around 3:45. Buzz is usually home by now, too. The kids do their homework, and we get ready for whatever activities are scheduled for the night, as well as make and eat dinner, if possible. Sometimes we have to eat after our activities. Home by 7/7:30, showers and bed by 8:30 at the latest. Then I have those other mommy duties to attend to: laundry, dishes, pay bills, workout, etc. Then, maybe even some more blog stuff. I try to get to bed by 11, but that doesn't always work. So, I hope I didn't just waste 2 minutes of your time with my enormously entertaining daily life. Seems like you are busy,busy,busy! 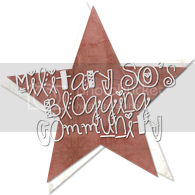 I have been wondering how I am going to deal with my blog, my part-time job, house life, and my little one once my oldest starts school in September!! But it is nice to know that it is completely do-able!! Phew... ;) Now, if only I could throw some workout routines in there, well, that would be great. Such a busy mommy! Maintaining a presence online and blogging can be a lot of work sometimes. It can easily be thrown aside. 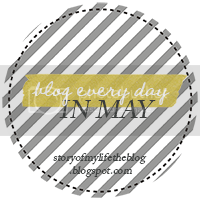 For me, I try to prioritize blogging, it's my therapy!